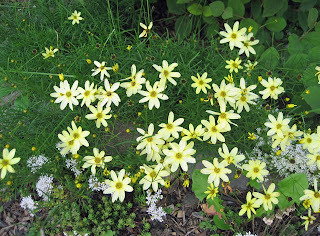 This Coreopsis ‘Moonbeam’ grows and blooms beside the entrance to my garden all summer long. I’ll use it to remind myself that this is the year I’m planting by the phases of the moon. By the way, this doesn’t mean I’m going to plant at night under a full moon or anything odd like that. You know I don’t like to be an odd gardener. It means that I’ll just pay attention to what the moon phases are and plant accordingly. Above ground crops from the new moon to the full moon, and below ground crops from the full moon to the new moon. But the effect of the moon doesn’t begin and end with planting. Apparently it can also affect the effectiveness of hoeing. According to the book, “Raising with the Moon -- The Complete Guide to Gardening and Living by the Signs of the Moon ” by Jack R. Pyle and Taylor Reese, hoeing, cultivating, and weeding are best done when the moon is waning, between the full moon and the new moon. So, good days for hoeing in March will be a few days before I plant the peas or after the 29th. Pyle and Reese also go beyond moon phases to suggest that various signs, like Aquarius, Pisces, etc. also have an impact on different activities. Some of these signs are considered barren signs and others are considered fruitful signs. They suggest that peas be not only planted when the moon is waxing in its 2nd phase, which is somewhere between a half moon and a full moon but also when the signs are Cancer, Scorpio, Pisces, Taurus, and Libra. After reading this, I went back to my almanac and checked March 17th which turns out to be in the moon’s 1st phase under the sign of Pisces. “Close enough”, I say. I’m still planting my peas on the March 17th. But I’ll probably forget about the moon phases when it comes to hoeing and pulling weeds. You know how it is. When you get that itch to hoe, or weed, you just have to go with it, regardless of the moon phase. My father always planted peas on Good Friday, no matter when it fell on the calendar. Amazingly, he never had a crop failure. Have you thought of planting one row on the appropriate moon phase and another at a different time just to test the theory? Could be interesting! Thanks for sharing the info! Oh goodness, it all sounds so complicated, I have a job remembering to plant things at all! That Coreopsis is lovely! I would never deny an urge to hoe or weed. It is difficult to get myself out there to do that in the first place. All the farmers in India do all their work according to the moon's phases and the planets' positions, even now. But I can't resist weeding and cultivating whenever I find time. Your coreopsis is so pretty! I come from a family of midwestern farmers who are religious about the Almanac, moon phases, and folk lore. Interestingly, they are all successful farmers. I think we need to pay attention to nature and what it tells us...so much knowledge that we simply ignore! I'm pretty busy these days, so if I find myself with some time I have to grab it while I can and make the most of it, no matter what phase the moon is in. I admit to being intrigued... but I'm still going to stick to Clemson University's planting guides for this region -- which, by the way, dictate planting peas in Aquarius. Geez, I hope that's not a barren sign. Please let us know how it turns out, though! Would be curious to see the difference between following the moon phases and not. Maybe we just didn't even have a moon here when my husband and I tried veggies last year, lol. I am fascinated by this! How can the moon be wrong? IT is like clockwork. Cool post. Hi, all, and thanks for the comments. Meredith... the signs they talk about are not the signs of the zodiac that we are used to. These signs occur throughout the year a few days at a time. Most almanacs show both the moon phase and the sign. I hope that isn't confusing! interesting. I 've never planted anything by the moon phases. I plant according to frost dates and wether I have enough time. Pretty boring I guess.